Until I stepped into the John Frieda Salon in Mayfair a couple of weeks ago, I didn’t realise what a state my hair was in. It’s coloured, long, dry, and the impact of the sun has really damaged it. I normally drench my hair with several oils and treatments, so considering its coloured, it’s in pretty good shape. However, I had recently noticed that it was looking flat, yellow, and lifeless. When I was invited to the salon for a blow dry using the the new Colour Wow Cocktails, the only word to describe the result is WOW – my hair was seriously transformed from burnt straw to super smooth silk! Color Wow is the latest innovation from Gail Federici, co-founder of John Frieda’s hair care company and visionary behind their ground-breaking formulas created to address problems specific to frizzy hair and blondes. 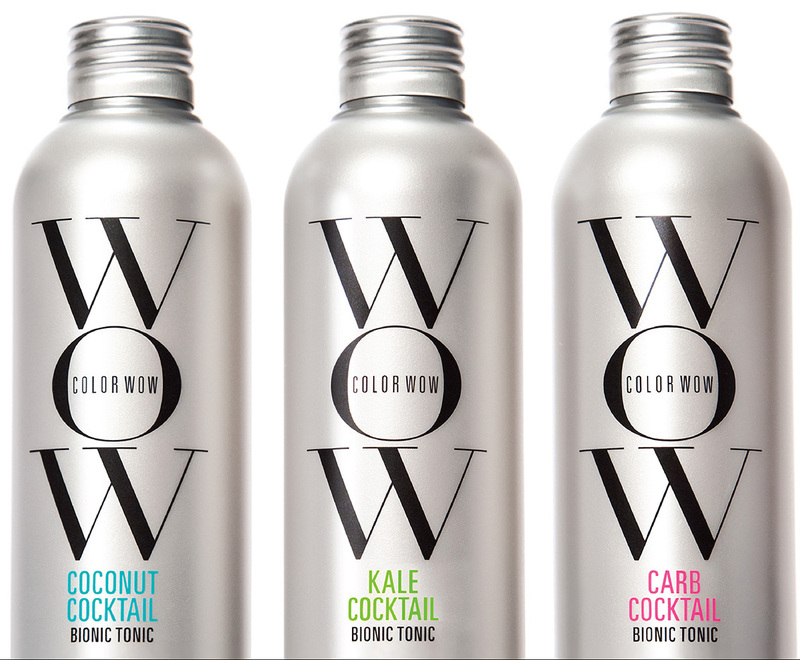 Colour Wow Cocktails are for people with colour treated hair. As you all know, Colouring breaks down the hair’s natural, internal cysteine bonds which give each strand strength and resilience. The Colour Wow Cocktails restore the corrupted internal and external bonds that are damaged during colouring to renew elastine and suppleness to reveal thicker and stronger hair. They come in three different formulations – Coconut Cocktail (contains coconut oil) to improve strength and flexibility, Kale Cocktail which strengthens hair by 50% in one use, and Carb Cocktail a heath activated blend of corn starch, cellulose, oat bran, quinoa and keratin protein to thicken strand girth and expand hair mass which makes fine hair thicker. The cocktail I chose was Kale, the strongest, and the best smelling. It doesn’t smell like Kale, but feels, and looks like a really nice conditioner with a really nice fresh scent. This mega-force “bionic tonic” with sulphur-rich sea kale helps relink and reinforce hair’s vital internal bonds. It’s loaded with protein-building Amino Acids plus B Vitamins. The strand- strengthening super-power smoothes, detangles and has been clinically proven to reduce breakage by over 50% after one single application, and also helps guard against UV ray damage. After one use, my hair feels like new again, and actually feels like hair. It’s shiny, soft, and I even manage to easily get a tangle teezer through it so I have ditched the three different oils I regularly use as I can easily detangle my hair, something I wasn’t able to do before. My hair feels and looks stronger, and it’s health has noticeably improved. All you need to do is add a 10p piece amount onto the ends of towel dried hair. It also aids in drying and the ingredients are activated by heat which don’t make you feel bad for blow drying. The results are really amazing, I would highly recommend this product.